Bright looks inspired by a heartwarming musical. In my last post, I said I was excited for spring, and it’s only been getting warmer since then! This week, we’ll look at an even more colorful musical that’s perfect for the season. Since Big Fish is all about the power of storytelling, it seems appropriate for it to use many different storytelling media. Daniel Wallace wrote the novel in 1998, Tim Burton directed the movie version in 2003, and Andrew Lippa and John August created the musical in 2013. The story takes inspiration from fairy tales, Greek epics (especially The Odyssey), and American tall tales. 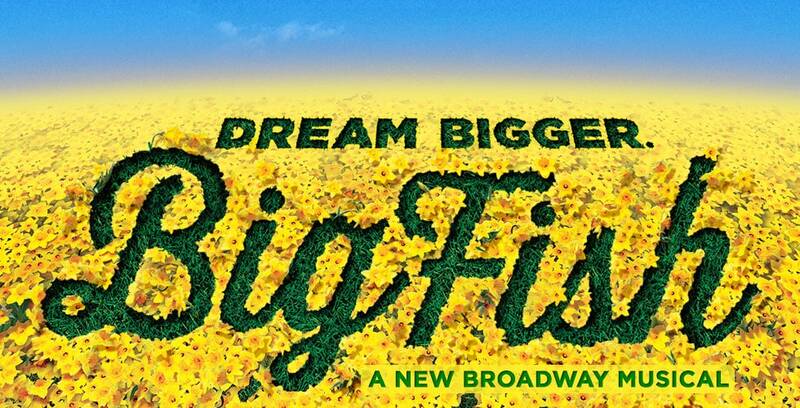 Big Fish focuses on the relationship between Edward Bloom, a traveling salesman battling cancer, and his son Will, who just got married and is about to have a child of his own. 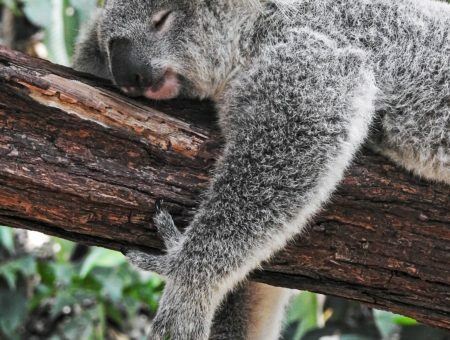 Edward is famous (or infamous, depending on who you ask) for telling wild stories about his life and adventures. As he prepares to say goodbye to his father and hello to his son, Will tries to figure out if anything his father told him was true. Productions of this musical use all kinds of theatre magic to bring Edward’s tales to life, from transforming costumes to scene-setting projections. The music, however, stuck with me more than anything else. The music is the heart of the story. I’ve created outfits based on three of the characters from Big Fish. Keep reading to see them all! You can rise to be the hero once again! Edward’s adventures take him from the towns and colleges to the forests and rivers of the South. If you’re adventuring in your town or city, channel him in a patterned dress reminiscent of the natural world. 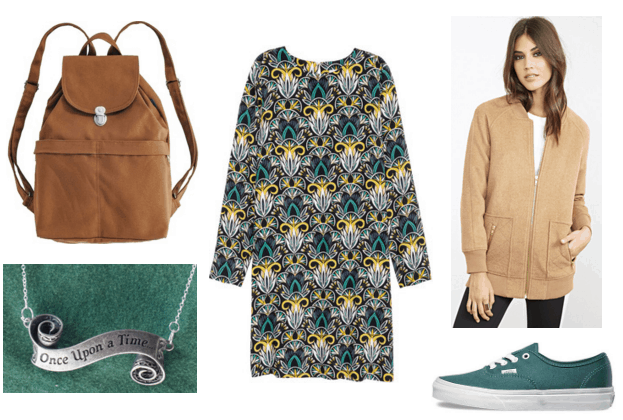 A necklace engraved with the words “Once Upon a Time…” represents Edward’s love of storytelling, and a tan bomber jacket and teal sneakers hint at his all-American look. Make sure you bring a backpack so you’re prepared for anything! I don’t need a roof to say I love you. I don’t need a roof to call you mine. I don’t need adventure in some far away frontier. I don’t need a roof to feel you near. Get Sandra’s girl-next-door look with a belted blue shirtdress and a light pink cardigan. Add sensible tasseled loafers, and keep your hair back with one of these braided headbands. Finish the outfit with a necklace featuring Sandra’s favorite flower: the daffodil. Brighter days for dad and me. So that strangers we will be no more. 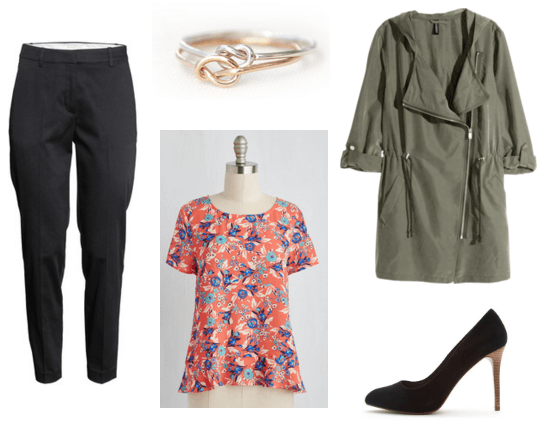 For a Will-inspired outfit, stay practical and professional with black slacks, black pumps, and an army-green utility jacket. A floral top hints at his last name and shows Will’s sillier side, while silver and gold knot rings represent his love for his family. Big Fish is a colorful celebration of storytelling, adventuring, and connecting with loved ones. If you feel like you need a breath of fresh air this spring, put on the cast recording and go somewhere in your town or city that you’ve never been to before! Have you seen the musical or the movie? Did you cry as much as I did? Are there any plays or musicals you would love to see covered in this column? Let us know what you think in the comments below!